Since making my own pumpkin puree a couple days ago, I have been brainstorming a bunch of different pumpkin recipes. I’m thinking about pumpkin everything; muffins, bread, cookies, cupcakes, etc. I want to make it all! I feel kind of late to the pumpkin party, though. Many people have already moved on to Christmas flavors like gingerbread and peppermint. I’m not ready for Christmas anything yet, and refuse to skip the rest of the fall. I mean, it is still fall, so technically it’s still pumpkin season and I’m definitely going to take advantage of that. After wracking my brain, recipe cards, and Evernote for anything pumpkin, I settled on making scones. In case anyone doesn’t remember, my first try at making scones was barely a success. My dough was way too wet, and they spread out into cookies instead of staying tall and flaky. Yes, they were delicious but they were hardly scones. I went to my favorite recipe fallback, King Arthur Flour, and decided to give their recipe a go. There isn’t much liquid in this recipe anyway, so I wasn’t too worried about extra moisture. I was smart about the cutting in of the butter, and used two forks instead of doing it with my hands. I think the heat from my hands may have played a part in the production of my first flat, cookie like scones. Everything came together beautifully, even though I thought they were a tad on the small side before baking. The result was a tall and golden brown triangle of flakyness, with fluffy layers of buttery goodness. The pumpkin taste is subtle but present, especially with the warmth from the homemade pumpkin pie spice. The soft and fluffy interior, against the crunchy crackle of the cinnamon turbinado sprinkled top is what fall days are made of. These scones solidified why I am not ready to move on to Christmas, and still won’t, as the fall still has many more flavorful things in store. In a large mixing bowl, whisk together the flour, brown sugar, baking powder, salt, and pumpkin pie spice. Work in the butter with two forks or a pastry cutter, just until the mixture is unevenly crumbly. Large chunks of butter are a-okay. In a separate mixing bowl, whisk together the pumpkin, splash of vanilla, and eggs till smooth. Add the pumpkin/egg mixture to the dry ingredients and stir until all is moistened and holds together. Scrape the dough onto the floured parchment or pan, and divide it in half. Round each half into a 5″ circle that should be about 3/4″ thick. Brush each circle with milk. 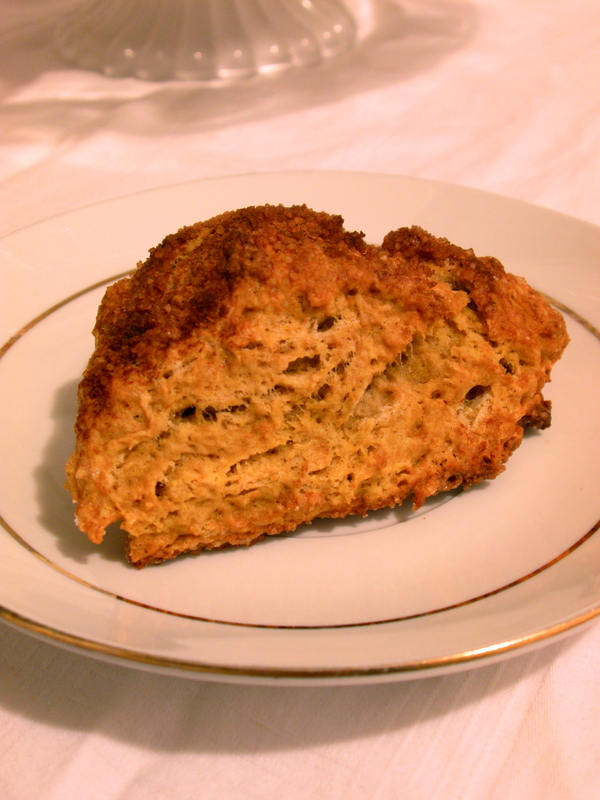 Combine the turbinado sugar and the cinnamon, and sprinkle onto the scones. Using a knife or bench knife that you’ve run under cold water, slice each circle into 6 wedges. Carefully pull the wedges away from the center to separate them just a bit; there should be about 1/2″ space between them, at their outer edges. Bake the scones for 22 to 25 minutes, or until they’re golden brown and a toothpick inserted into the center of one comes out clean, with no wet crumbs. 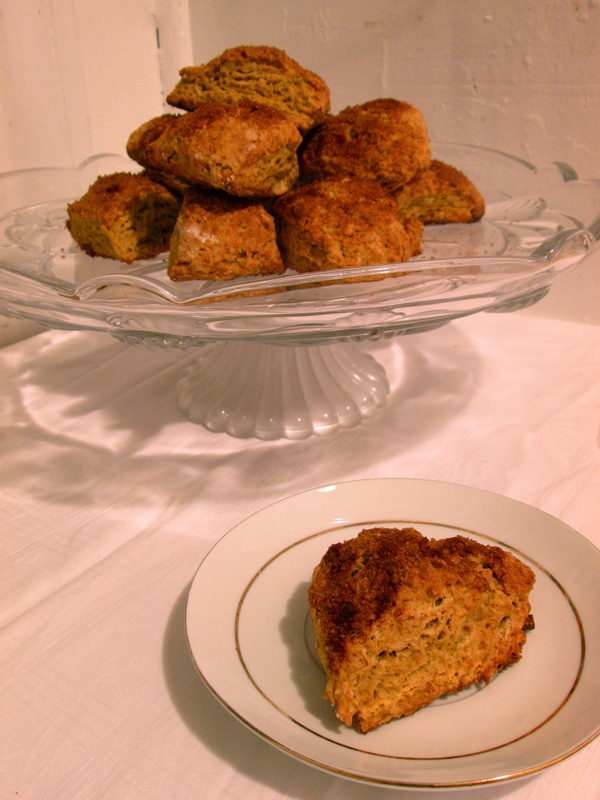 Remove the scones from the oven, and serve warm. Wrap any leftovers airtight, and store at room temperature. I used brown sugar, the original recipe calls for regular, white sugar. Feel free to use either. Please DO NOT skip freezing the scones. It really does help them rise, and also keeps them flakier. I forgot to brush them with milk before sprinkling the sugar, don’t fret if you do too. The original recipe also included mix-ins like candied ginger, cinnamon chips, or chocolate chips. You can add 1-2 cups to this recipe, but you may need to add another egg or up the pumpkin to a full cup. I also used pumpkin pie spice, in lieu of the individual spices.